Urban Decay are really making sure they make the most out of the hype over their Naked collection - first we had eye palettes now we have foundation, bb cream, nail polishes and a cheek palette! For Christmas as one of my gifts from my brother, I received a £30 gift card for the Metro Centre and I thought what better way to spend it than on some luxurious beauty products. After seeing so many people raving about this new cheek palette from Urban Decay, I knew I had to have it so I marched into Debenhams, picked up the palette and didn't have to pay a thing for it meaning no damage was done to my bank in the process (wonderful)! 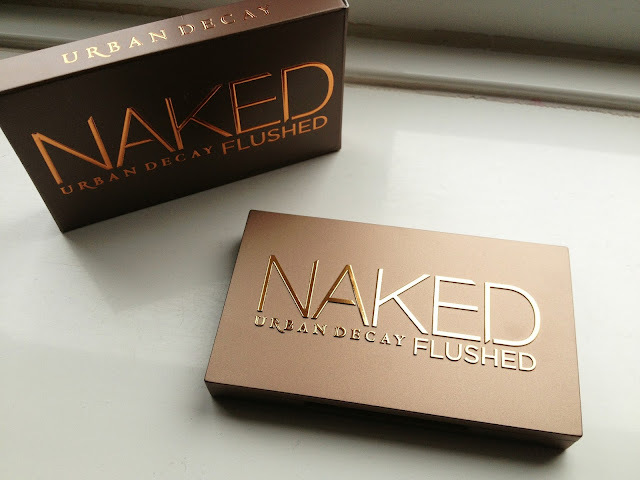 The Urban Decay Naked Flushed Palette costs £20, which is quite cheap for the amount of product you get, and can be found in most UD stockists (Debenhams currently have it on offer). The palette includes a bronzer (described as "sheer medium bronze satin"), a highlighter (described as "soft pink champagne shimmer") and a blusher (described as "dusty rose satin with a hint of shimmer"). Bronzer: I really like this bronzer as its not too dark for my skin tone as I am quite pale but is instead a perfect tan shade and shows up just right on my skin; however, I don't think it would show up much on darker skin tones. I like to apply the bronzer with my Real Techniques Contour Brush. The bronzer itself isn't powdery but is actually quite firm meaning it is easier to handle as there is not much excess. Although UD describe it as "sheer" and "satin" making you think it would be very glittery, I can hardly see any glitter in it at all which is just how I like my bronzer. Highlighter: I really like this highlighter however, a little goes a very long way as it is very sheer. I love the finish this highlighter gives my make up and I like to apply on my eyebrow bone and at the very top of my cheek bone using my finger (mans best tool)! Blusher: I absolutely love love love this blush as it is lovely for adding a healthy glow to the cheeks making even the illest of people look as a fresh as a daisy. The colour itself is a medium-dark rose and you definitely don't need a lot as the pigmentation is immense and takes a lot of buffing for a more natural look. It has a tiny bit of shimmer however, I personally never notice it and would say it looked more matte than anything. I personally like to apply this with my RT Expert Face Brush and then buff it in with a blusher brush I've had for quite a while from M&S which I love! Overall, I would definitely say this product is worth the hype however, I'm not sure it would work as well on darker skin tones (especially the bronzer) but I love it. The only downside of the product is I think they should have made the blusher the largest portion of the product and the bronzer the second biggest. 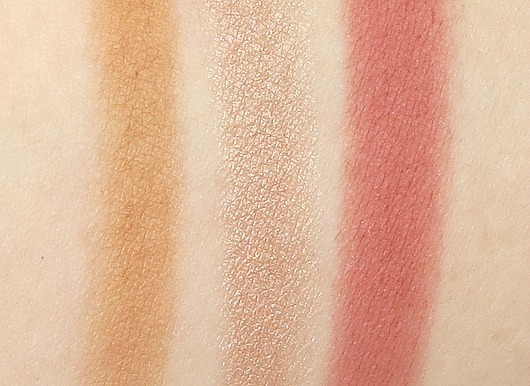 Have you tried the Naked Flushed Palette or will you be? What's your favourite NAKED product from UD? Great review, love the blush colour to. The swatches look great, the colours really show! The blush colour is beautiful - definitely the best part of the palette. I wish it was the largest segment! I love it! It is perfect for giving you a healthy natural glow. Thanks for the swatches, this palette is really pretty. I kind of feel like UD has been going a bit overboard with all the Naked products... the original Naked palette is still my favourite. They've definitely ensured they make the most out of people's love for it that's for sure! I've never tried the original Naked Palette but I have the 2nd and I love it! I love love love love love it! It's definitely worth the money. Ah I'm so jealous I seriously want this! I love it! I'd definitely recommend picking it up for the spring/summer months and it should last for ages as a little goes a long way so it is without doubt worth the money.